Vaseline has recently introduced a new limited edition lip balm flavor: Sugar Coated. Judging from the name, I expected a sweet candy like flavor, but that wasn't the case. To me, it smells a bit like the signature Nivea scent with a fleeting hint of lemonade. This is great if you don't like overly sweet and nauseating scents. Personally, the scent isn't blowing me away, but the tin does. It has a very pretty, metallic pink, sugar scrub like print. 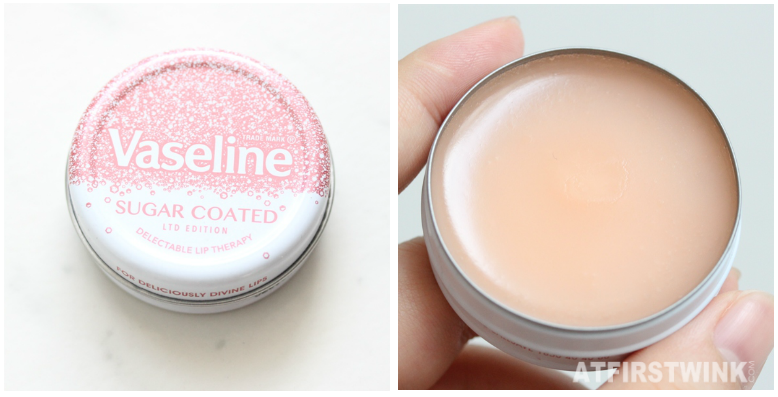 On the lips, the Vaseline Sugar Coated lip balm is soft and spreads out well, feels light-weight, and stays glossy for quite a long time. It feels a lot more comfortable than the last time I used a Vaseline lip balm and that has been ages ago. It is also supposed to leave a light hint of pink on your lips, but on my pigmented lips, it isn't really visible.